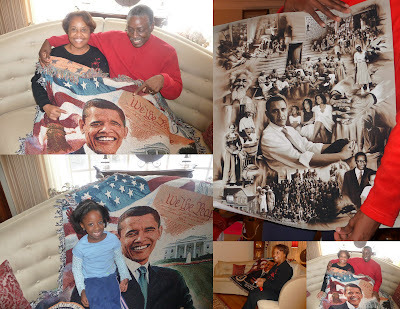 Who Else Had An Obama Giftgiving Christmas? This Wishum Gregory design made into a cotton throw is OUTSTANDING! I got mine from the good folks of SecondLove.com out of Emporia, Kansas. I couldn't have been more pleased with their Customer Service. Thanks SecondLove.com!! Thanks for sharing. I LOVE IT!! How did you find them? First, I got the idea to do it; then, I just searched the Web to see what existed in the marketplace. Next, I diligently contacted several resellers and placed my order with the companies that provided the best customer service and delivered high-quality products. I had to tell you about it! Several members of my family received Obama books this year.